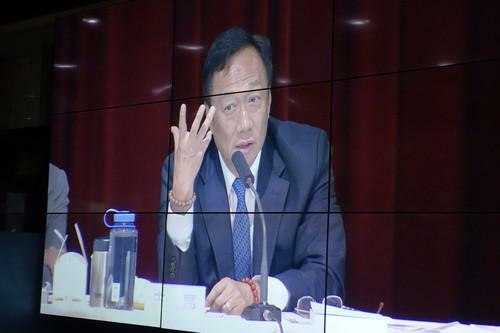 Foxconn's CEO Terry Gou displayed on a monitor at the company's annual shareholders' meeting. Expect more wearables, robots and even electric cars to come from manufacturing giant Foxconn Technology Group, as the Taiwanese company tries to reinvent itself as a broader technology service provider. While Foxconn now mainly manufactures products for vendors like Apple and Sony, the company is hoping to seize on new opportunities emerging in the market. "When a typhoon comes, even a pig can fly," joked Foxconn's CEO Terry Gou at its annual shareholders' meeting on Wednesday. Foxconn will move beyond product assembly, and invest in content creation cloud services, and networking technologies. In the case of wearables that can track a user's health, an entire ecosystem is needed to analyze and store the data, Gou said. Some of these new directions are already producing results. Earlier this month, Japanese tech company Softbank unveiled Pepper, a personal robot that Foxconn helped develop. Pepper is designed to interact with humans, and can talk and even read people's emotions. "I believe it will become a huge platform for human companionship," Gou said, adding that additional software services could be bundled with the robot. In the electric car realm, Foxconn is already a partner with U.S.-based Tesla Motors, having built the touchscreen found inside the company's vehicles. But on Wednesday, Foxconn's CEO revealed that his company is developing its own electric cars, with a target price of less than US$15,000. Gou declined to give further details, but said the company has many customers for its electric car batteries. In April, Foxconn announced it was working with China-based Beijing Automotive Group to develop new batteries for such vehicles. Expanding into new manufacturing areas could help Foxconn diversify its revenue streams. The company makes about 40 to 50 percent of its sales from assembling Apple products, according to analysts. But rival manufacturers are competing to take those orders away from Foxconn, and offering lower production costs. On Wednesday, Gou urged patience from the company's shareholders. "We need to put our money in long-term technology investments," he said. "Right now, making notebooks and other devices isn't worth it for us to manufacture."